FILE - Amazon founder and CEO Jeff Bezos arrives at Sun Valley Lodge for a conference, July 9, 2014, in Sun Valley, Idaho. Amazon CEO and world’s richest person Jeff Bezos is now even richer, according to an estimate Friday by Bloomberg. 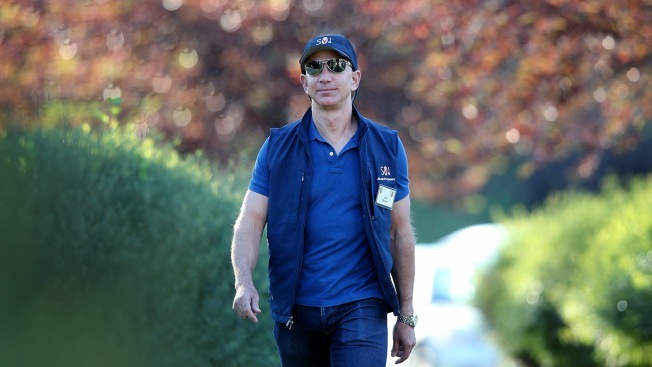 As CNBC reports, Bezos’ net worth surpassed $100 billion on Friday. Amazon shares hit a record on one of the year’s busiest shopping days, joining a broader Black Friday market rally. Bezos, who founded Amazon, owns about 78.9 million shares of the company, according to a Nov. 14 filing. That stake alone is worth more than $93.5 billion as of Friday’s closing price of $1,186 a share. In addition to Amazon, Bezos also invests in start-ups, owns The Washington Post and space company Blue Origin.